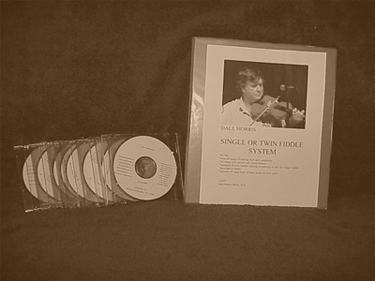 "SINGLE OR TWIN FIDDLE SYSTEM"
A set of 8 CDs, accompanied with 91 pieces of sheet music! Songs are of varying degree of style and complexity, recorded in stereo. When tracks are played on stereo players with “balance control” the lead fiddle and harmony tracks can be partially isolated for study purposes. The format for the CDs is as follows: The first track for each song will be “normal tempo”. Immediately following will be a slowed down track (for study). This will be the slowest track. Next, will be A slightly “faster” slowed version, and so on. The song tracks being arranged in this order will be of great benefit to the player. About the system: I actually began this project in 1988. Originally it was available as a cassette tape audio system. As cassette tapes became more or less obsolete with the emergence of CDs the “system” lay dormant until approximately a year ago, at which time a student in Wisconsin urged me to revive it on CD format. This became quite an undertaking, first of all “re-writing all of the music” (the original was all hand written). Secondly the transferring all material to digital CD format. Thirdly, and possibly to most important “change” from the original system, was the addition of more slowed down versions for each song. Having these slowed down tracks for each song will prove a great advantage to the use. Below is general instruction for use CD’s 1 through 6 are all songs with slowed down versions of each (more than one slowed down version where needed). CD’s #7 and 8 are ALL of the songs, NORMAL tempo, back to back. These are, more or less, “bonus CDs” and can be used as “listening CDs”. On the heading of each piece of music will be CD reference number as well as track study numbers. There are 91 total pages of sheet music in the system. Page numbers will be found at lower left between lead and harmony lines. As far as lead and harmony lines, top line is lead. Bottom line is harmony. There are a few songs, however, in which lead and harmony are found on separate pages, i. e. Bonaparte’s Retreat and Bob Wills Medley.